DEVELOP3D writes about running SolidWorks in the cloud using NVIDIA’s Grid Test Drive. Congratulations to Altair for being recognized as a 2014 Michigan Bright Spot, helping drive forward the state’s economy and innovation. Do you find the Jacobi Iterative Method more useful now that it’s been sped-up by a factor of 200? More reading, this time about grid generation for near-field sonic boom prediction. This real-time, animated flow viz will help you track how Hurricane Arthur is messing up July 4th for the U.S. East coast. Click image for website. A team composed of Argonne National Lab, Caterpillar, and Convergent Science were awarded an HPC Innovation Excellence Award at the ISC’14 supercomputing conference for their work on internal combustion engine simulations. VirtualGrid released VRMesh v8.5 for point cloud processing. Flow Science released FLOW-3D Cast Version 4. The open-source PIConGPU, a GPU-accelerated Particle-in-Cell code, has been released. There’s an opening for a PhD student in the field of fluid mechanics at the Vienna University of Technology. Take 10 minutes for a video demonstration of CFD in Femap. Click image for video. How will we program applications that have billions of threads? And how will we do so in a way that’s robust? Who is going to do all this programming? It’s not within the typical CFD programmer’s skill set. Power consumption is an issue, not from the “green” standpoint but from the “is it really worth 250 MW to run one computer” standpoint. IBM says that chips with carbon nanotube transistors will be available by 2020 and yield a 5x speed-up. We in CFD often get trapped in certain ways of thinking, like how FEA is really mature, widely adopted, and robustly applied by non-experts. However, you can make the case that Mechanical FEA Is In Its Infancy with opportunities that sound very similar to those related to CFD. Because we in CFD rely heavily on numerical algorithms and visualization for our work, Mike Bostock’s work on Visualization Algorithms is a must-read. Not only is the work interesting, but its presentation on the web is fantastically visually pleasing. Take the time to read it. 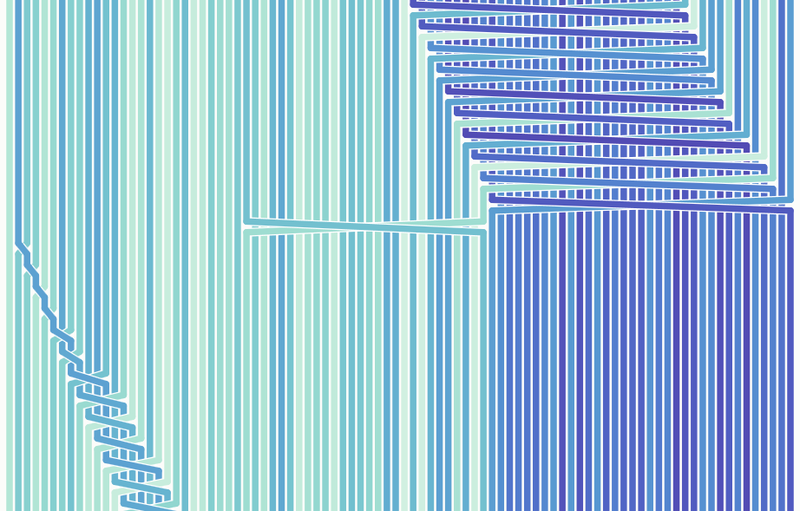 A portion of a visualization of a quicksort algorithm. Image from Mike Bostock. Gizmodo wants us to believe that the line of ladies’ handbags, purses, and clutches from designer Issey Miyake are inspired by origami but we at AFM know a mesh when we see one. Check out this animation of the Distortion clutch on Gizmodo. The Bao Bao website defines their concept as “shapes made by chance.” This tells me that Issey Miyake knows more about mesh generation than we might first think. Because sometimes it feels like whether or not meshing works is a random act. 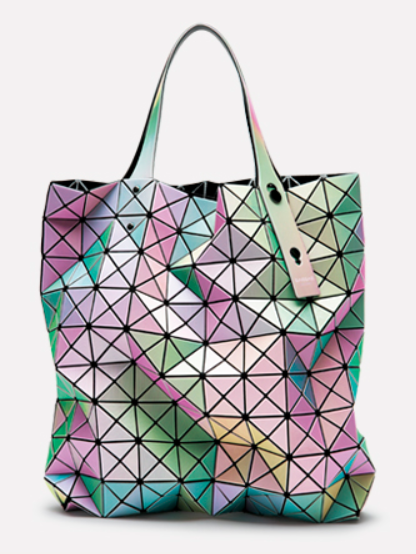 This delightful pastel Prism Rainbow bag from Bao Bao Issey Miyake is the perfect tote for any CFD conference. This entry was posted in Applications, Hardware, News and tagged Altair, Autodesk, Convergent Science, exascale, Flow Science, FLOW-3D, IBM, jobs, mesh generation, NVIDIA, PIConGPU, SolidWorks, VirtualGrid, visualization, VRMesh. Bookmark the permalink.